As you may have read in my previous post, I am lucky enough to have RX Strength Training as my Miss Boston sponsor this year! They are partnered with Energy Bits, and I got to participate in an Energy Bits Workout of the Day (WOD)... This one was specially named "Miss Boston's Dumbbell Blast" and it sure to give you a great workout with hardly any supplies! So lets get started! Here is a great workout that targets your core, back, arms, (and heart)! Grab two dumbbells (I used 15 lbs in each hand) and aim to complete 8 reps of each exercise. Take a one minute break, and repeat this 4-5 times. YOU CAN DO IT! And now for the workout tutorial if you have any questions on technique or form, compliments of the incredible Jeff Butterworth who has taught me everything I know about weightlifting! But first, if you would like a little laugh (at least we thought it was funny), my sister Lauren and I were joking about the workout tutorial I filmed above and decided to make our own after I came home from the gym. That is all for today, folks! 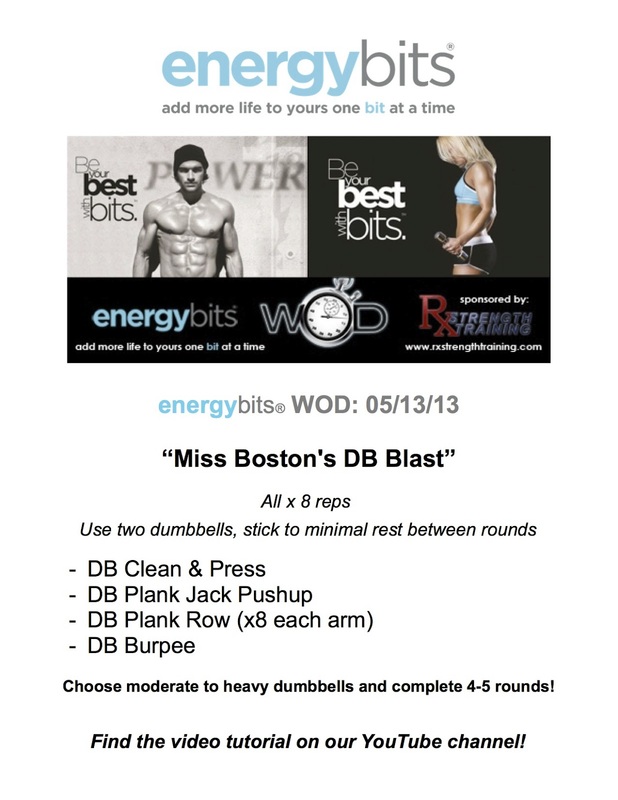 Enjoy this new workout and check out the other WODs on the EnergyBits Pintrest page! It is NEVER too late to enhance your lifestyle. Choose health NOW!